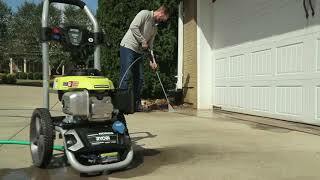 3000 PSI HONDA E-START PRESSURE WASHER is rated 4.8 out of 5 by 99. Rated 4 out of 5 by toto944 from Very good unit After having borrowed a friend's Ryobi washer for a month, I decided to buy my own. I was very happy with it. It's a good balance of power, versatility, and price. I'm a Honda fan, so having a Honda engine is a huge plus. The electric start is a nice feature. The only reason I'm giving 4 stars out of 5 is that the unit was completely covered in oil when it arrived. The air filter was saturated with oil. They test the units out before shipping, but this one was not drained. Oil everywhere. Customer service said this was normal and told me to rinse off the filter. Otherwise a good unit for the money. Rated 4 out of 5 by JohnR from Great features, but an issue needed to be resolved Initial purchase was returned to the local HD store after 10 minutes of use due to poor performance. Engine could not produce the power required for the job. The store handled the situation well and I received my refund. The second pressure washer performed worst, not able to start. Your frustrated customer determined the root cause of the problem. The air filter was saturated in oil, as was the entire washer. The RYOBI tech personnel suggested washing the paper air filter in Dawn dishwashing soap. Do not waste your time!! I replaced the air filter at my expense along with removing the excess oil from the filter housing and the engine ran well. Overall good performance after 5 hours of use. I am sure the 1st power washer I returned had an oil soaked air filter also. This is an issue which RYOBI can easily avoid. Rated 5 out of 5 by ParkerD25 from Great product Bought this unit not too long ago, mainly for stuff around the house; garage, car, etc. but I had the chance to make some extra money by power washing the stairwells of some condo buildings. I ran this thing for 8 hours straight one day and 5 hours the next, and this pressure washer was awesome. I didn’t have any issues at all. I haven’t had it long so I don’t know how it performs over time but from what I have experienced so far I would definitely recommend it. Rated 5 out of 5 by MotoNut from Great price and an electric Honda engine! I shopped around and compared brands but the Ryobi RY803001 was highest quality and was on sale. The free shipping sealed the deal. I got it in 2 days. It took about 5 minutes to get set up as it came with everything well packed and even included a bottle of engine oil. the only thing not included was some gas. The battery was fully charged when it arrived and the washer fired right up the first time I hit the electric start button. Works perfectly and is small enough not to take up much room. This was a great investment and a great price. Rated 3 out of 5 by Bob Mc from Oil Received Oct 10. Nowhere that was visible. did a comment warn me not to tilt the washer when removing from the shipping carton. Unfortunately, there was an oil leak on my garage floor. I contacted Sandra, technical, on Oct 17 to tell her of this issue. Her solution was to not tilt the washer and get some "bra clean" to remove the oil from the foam air filter. I did not have time to go to an auto parts store to buy the cleaner, so, I went to Home Depot to buy another. What do you think I should rate your washer or company ? 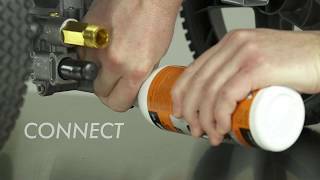 Rated 5 out of 5 by RAY T from Saving my shoulder for billiards I bought the Ryoby 3000 PSI elect start pressure washer a couple of weeks ago, It is easy to operate, and it is the first washer that I ever owned. I especially like the electric start because I have rotator Cuff problems. I hate starting equipment like mowers, trimmers etc,( it hurts my sholder) I am a senior billiards player and I am saving my hurting sholders for that. So if you have any medical problems this is the pressure washer for you. Buy it on sale like I did. $300.00 was a great deal. BUY IT AT HOME DEPOT ! Rated 4 out of 5 by Matt319 from Pressure Washing Fun I bought this last weekend because the house I moved into and pavers were in need of a nice washing. Overall I am happy with the purchase. I think my expectations were too high for outcome of washing, but I can’t fault the pressure washer. There was a significant layer of dirt and algae built up. Washer was easy to set up and start. The hose was a nice length to allow a large range of washing before needing to move the machine. I plan on blasting my deck this weekend. Rated 5 out of 5 by fishingfool150 from Easiest one yet! Very nice. The electric start is, without question, the best feature of this PW. The footprint is adequate for easy storage. The power is more than adequate for routine home, car, RV, boat maintenance. Two factors that put his one over the top vs. a comparatively priced model from another vendor. The Honda engine and the Ryobi customer service. If you think customer service is not that important, try contacting some of the other vendors when you run in to a problem for any issues with their products. 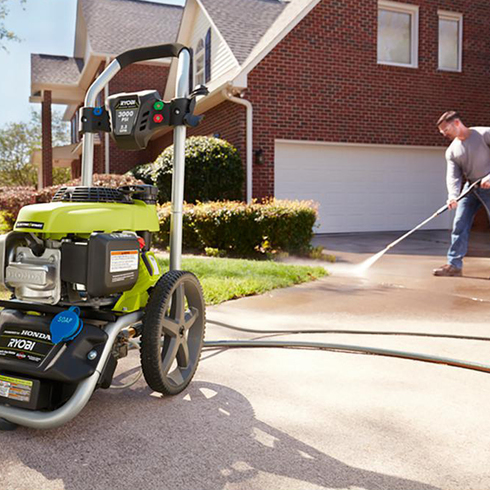 This RYOBI 3000 PSI Pressure Washer is the first of its kind while featuring both a Honda engine and electric start functionality. 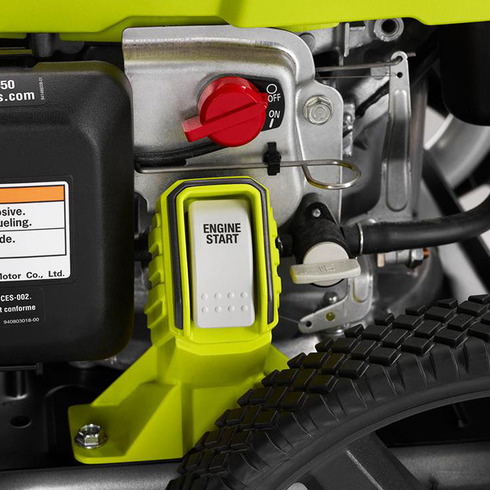 The built in battery maintainer keeps the included 12V battery charged between uses – getting you back to work faster and the job done sooner. This powerful pressure washer features a reliable and professional GCV Honda Engine, producing 3000 pounds per square inch of pressure (PSI) and delivers 2.4 gallons per minute (GPM) of cleaning force. This pressure washer is guaranteed to deliver professional results for years to come with 2-year Honda engine warranty and a 3-year limited manufactures warranty.